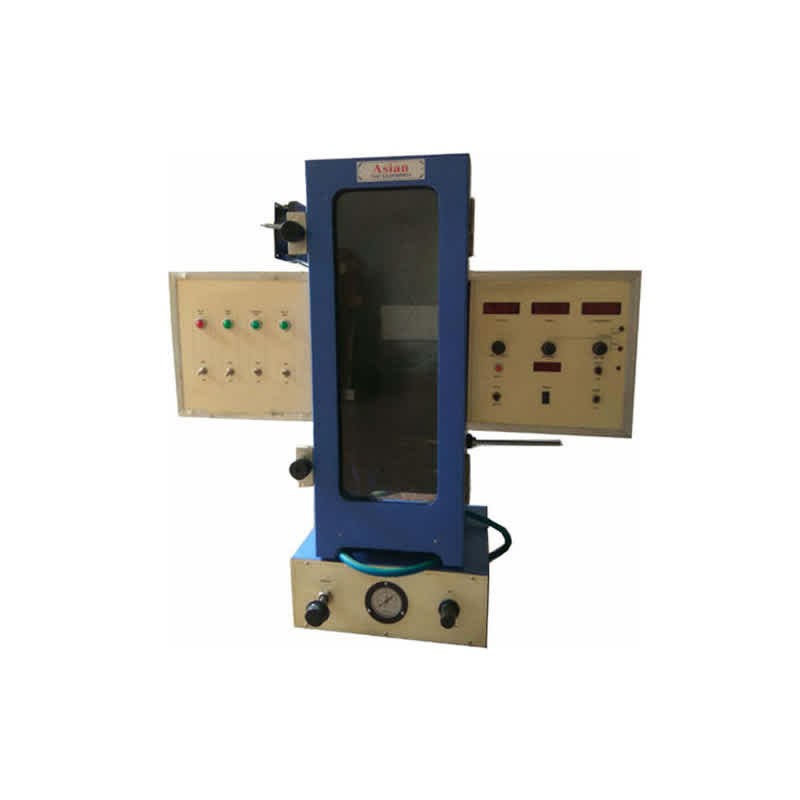 Smoke Density Tester is constructed using 14 gauge aluminum box, which is hinged a heat resistant glass glazed door. This box is mounted on the base which houses the controls. Dependent upon the materials tested, the metal may require protection from corrosion. The chamber is sealed except for 25 by 30mm (1by 9in.) openings on the four sides of the bottom of the chamber. A liters/min specified capacity blower is mounted on one side of the chamber. The inlet duct to the bowler is equipped with a close fitting damper. The outlet of the bowler will be connected through a duct to the laboratory exhaust system. The two sides adjacent to the door are fitted with 70mm (2/3in) diameter smoke tight glazed areas entered 480mm (19/4 in.) above the base. At these locations and outside the chamber, boxes containing the optical equipment and additional controls are attached. A removable white plastic plate is attached to the back of the chamber. There is a clear area centered above the bottom of the chamber. Through which is seen an illuminated white on the red exit sign. The white background permits observations of the flame, smoke, and burning characteristics of the materials. The viewing of the exit sign helps to correlate visibility and measured values. The specimen holder is supported on a square gauge. Stainless steel wire cloth above the base and equidistant from all sides of the chamber. This screen is lying in a stainless steel bezel supported by a rod through the right side of the chamber. From the same rod similar bezel is located below and it supports a square of asbestos paper which catches any particles that may drip from the specimen during the test. By rotating the specimen holder rod, the burning specimen can be quenched in a shallow pan of water positioned below the specimen holder. The specimen is ignited by a propane flame from a burner operating at a specified pressure. The fuel is mixed with air which has been propelled through the burner by the venturi effect of the propane as it passes through a small orifice. The burner is designed to provide adequate outside air. the burner is capable of being positioned quickly under the specimen so that the exit of the burner falls on a line passing through a point 8mm above the base at one corner of the chamber extending diagonally across the chamber and sloping upwards at 45 deg with the base. There is a control panel which controls and indicate the supply of gas. Lux of the light measurement system of the mounted light source also mounted in the instrument. There is a digital timer mounted in the instrument to indicate the time.